We Australians are among some of the highest waste producers in the world. Whether the waste is from personal, commercial, or other large-scale use, tons of rubbish are processed each year. You’ve probably realised that your activities at home or in the community result in a lot of different types of waste. It can be everyday waste like papers or plastics, or waste from your most recent renovation. Most likely, you quickly do your rubbish removal and have them sent through as mixed or unsorted waste. However, you should consider sorting your waste, and here are reasons why. There are a variety of environment and regulation-related reasons why it is best for you to sort your waste. Many problems are generated because of unsorted waste. For example, when recyclable materials are mixed in with non-recyclable materials, there is a loss in possible resources for the future. Another problem is landfill space and contamination. Your waste takes up a lot of space. If it can be processed in some other way, then that would be better for everyone. It’s also practical to sort your waste. When you hire skip bins, there are certain considerations you have to think of about. Skip bins for hire in Newcastle often restrict certain waste types. You cannot place prohibited waste, other waste types that need adjustment to, and waste different from those agreed upon booking, in a hired bin. If you put prohibited waste types in the skip bins, then you will have to face the consequences. This includes having to adjust the price. The waste type determines whether or not the original price for the skip bin is applicable, or if additional disposal charges are required. Sorting your waste for removal is also smart because it can save you from additional expenses. Skip bins in Newcastle are limited by weight restrictions. Mixing in heavy waste like bricks or soil with your general waste can cost you a lot of money. Simply put, segregating your waste makes you more certain of the disposal costs of your waste type. You can maximise your cheap skip bin hire with smarter waste sorting. To be able to sort your waste, you’ll have to know the types of waste that skip bins accommodate. Clean Fill/Soil Only Skip Bins: These are bins that are only for dirt, sand and soil waste removal. Bricks, Concrete & Tile Only Skip Bins: These bins are for heavier material rubbish. Green Waste Only Skip Bins: For grass clippings, shrub and garden clippings, branches, woodchips, bark, wood, palm trees and branches, weeds. However, you should not include tree stumps or branches greater than 100mm diameter, fence palings, timbers, copper logs, or sleepers. Steel & Aluminium Only: For the metals as specified. Start sorting your waste today! 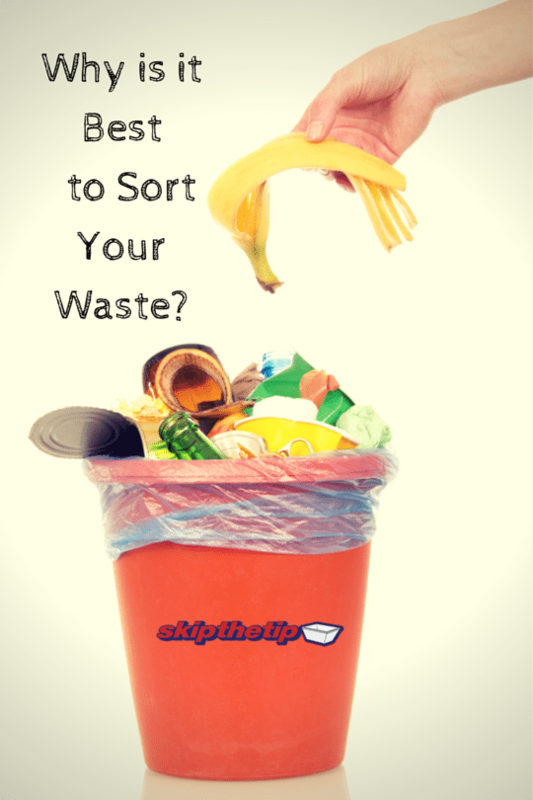 Still unsure of how to sort your waste? When you hire a skip bin in Newcastle, Skip The Tip will help with your rubbish removal and management. With our 16 years of services in Newcastle, we have the experience and drive to help you. We deliver professional, reliable and friendly service, with prompt delivery and pickup, 6 days a week. Start sorting your waste with a Newcastle skip bin hire today.